I made these yesterday because I was incredibly depressed in the morning, and I thought that baking would cheer me up. By the time I started baking in the afternoon, I mistakenly thought that these were no longer commiseration-cookies, but celebration-cookies. Of course, this morning I discovered that they were, indeed, commiseration-cookies. But that does not detract, in any way, from their deliciousness. 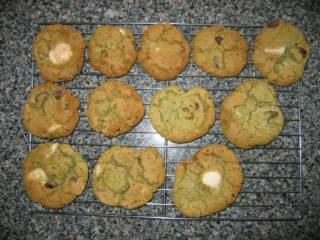 I have made this biscuits before, ages ago, and I recall them being nice, but unspectacular. 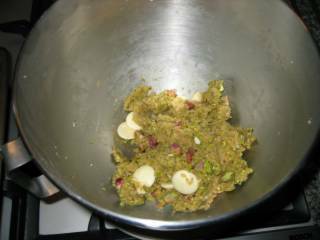 I chose to reprise them simply because I had pistachios and white chocolate sitting around… In fact, initially I was thinking of making the Breakfast Biscotti again (because they’re lower in fat), and simply replacing the almonds and dark chocolate with pistachios and white chocolate. But my brother said to me, “Just make the biscuits! Don’t make things so complicated!” So off I went to make the fantastically sugary and buttery biscuits from the original recipe. 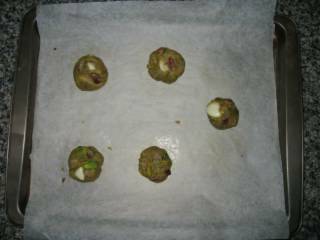 The cookie dough turns a fabulous shade of green, thanks to the addition of ground pistachios. They also spread out quite a bit on cooking, so there’s no need to squish them down too much. I think they’re better a bit thicker anyway. The recipe states that it will make “about 36” biscuits. Hah. I got 29. But there is absolutely nothing wrong with slightly larger biscuits. Largeness is a completely desirable quality in a biscuit. They are absolutely delicious! Much better the second time around. (And I owe it all to my KitchenAid mixer and new oven… I think). I would describe their texture as akin to Mrs. Fields’ cookies – soft and chewy, with a slight crunch. And it would be easy to substitute other nuts and chocolates. White choc and macadamia! Pecan and dark chocolate! Peanut, milk chocolate and raisins! Oh the possibilities! I feel quite guilty though, they’re so nice that my dad can’t stop eating them. I remember the last time I felt depressed, my friend Nathan suggested that I bake and eat a whole chocolate cake. Tempting idea, but I restrained myself in the end. I have since discovered that biscuit baking is the ideal depression cure. The baking is fun, it smells great, and you can (theoretically) eat only one cookie, thus feeling comforted but not entirely guilt-ridden. As Nigella says, these cookies provide “elegance and comfort” in each bite. I had one delicious cookie and then scarpered sharpish to the gym. Nice pictures and well written!! !